My daughter LOVES putting things to bed. It’s crazy, but since she could first walk, she was tucking things in. 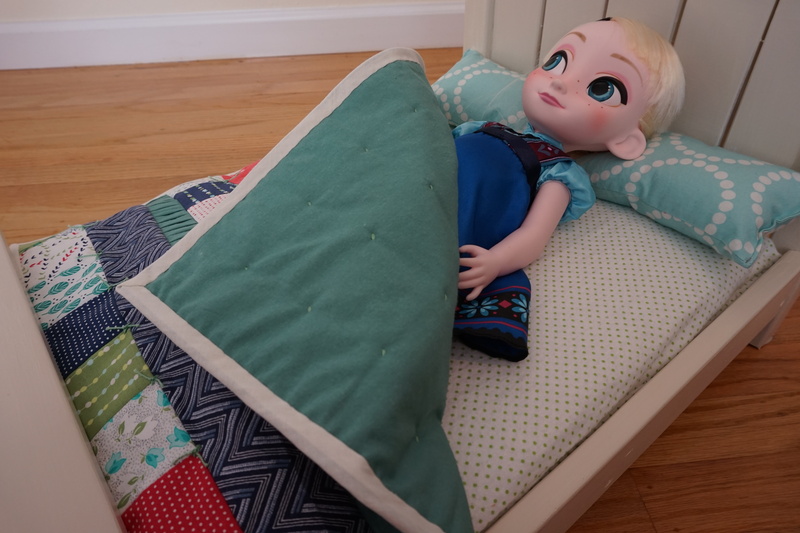 I can’t believe we didn’t think of this sooner, but the perfect toy for her is a bed! After seeing these plans, I knew exactly what she was getting for Christmas! It was put together pretty quickly, in just one afternoon. We put two coats of primer and two coats of leftover paint on it. At some point I’m going to do that whole antiquing thing, but we ran out of time before Christmas. 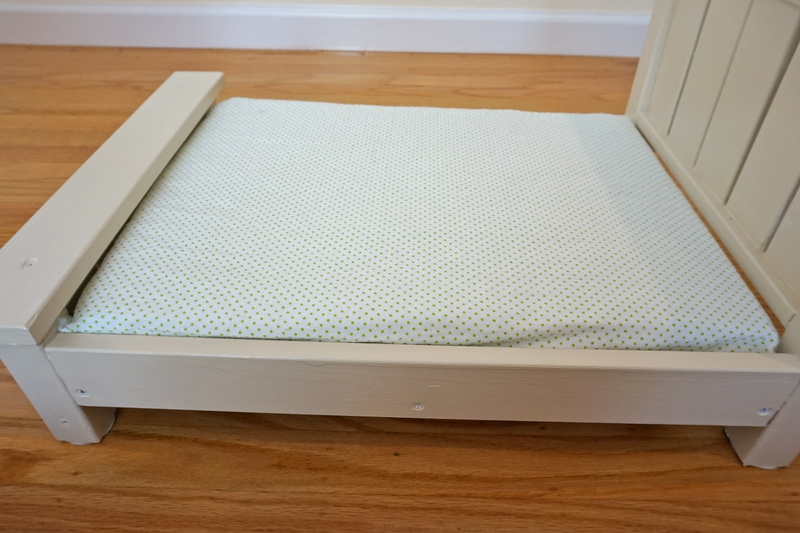 For the mattress, I had some leftover foam that I cut 15″ wide by 20″ long. It is 1.5″ thick and a little squishy. 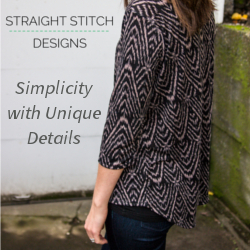 I used a piece of flannel 15.5″ wide by 40″ long, sewed up the sides, slid the mattress in, then serged up the end. I didn’t worry too much about the seam at the bottom of the mattress because it tucks right under the bed frame. It fit perfectly too! 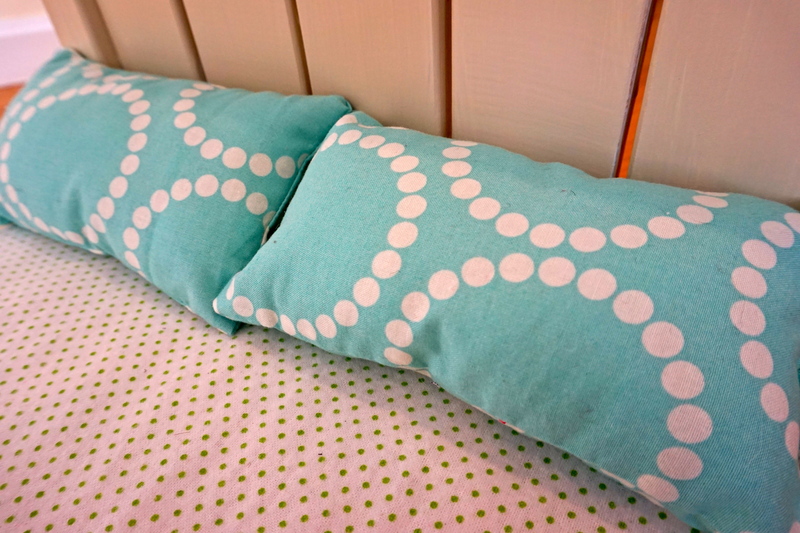 I also whipped up some pillows using a piece of scrap fabric that was thrown into one of my Etsy purchases. You gotta love that! 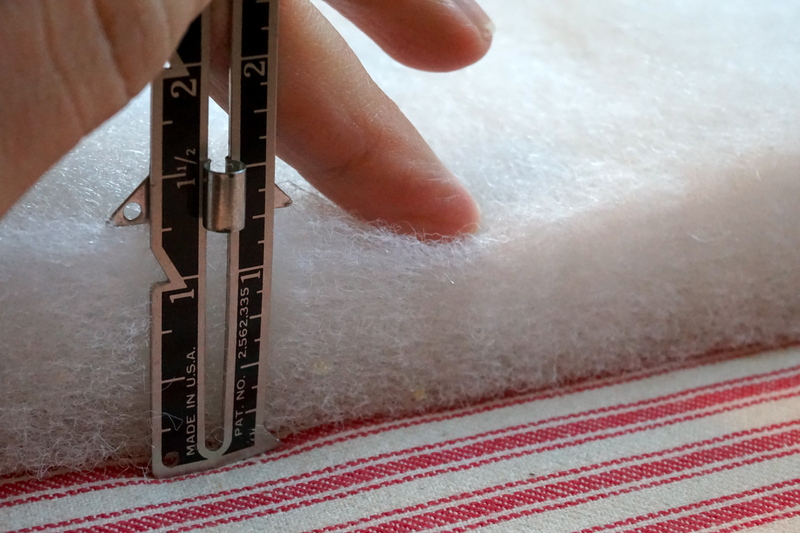 I cut four pieces 5″ wide by 8″ long, sewed along three complete sides, stuffed with stuffing, and closed up the last side. 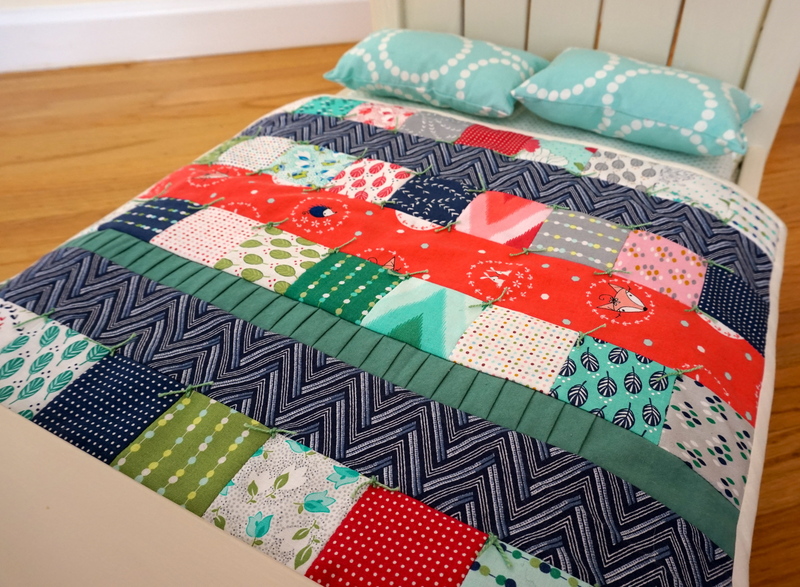 No bed is complete without a quilt! I used the Moda mini charm pack in Color Me Happy, as well as a few scrap fabrics. Each row was 2.5″ wide, and I used 1/4″ seam allowances. There she is tucking her 18″ dolls into bed. We got her Emma on the left, and Santa gave her Elsa. 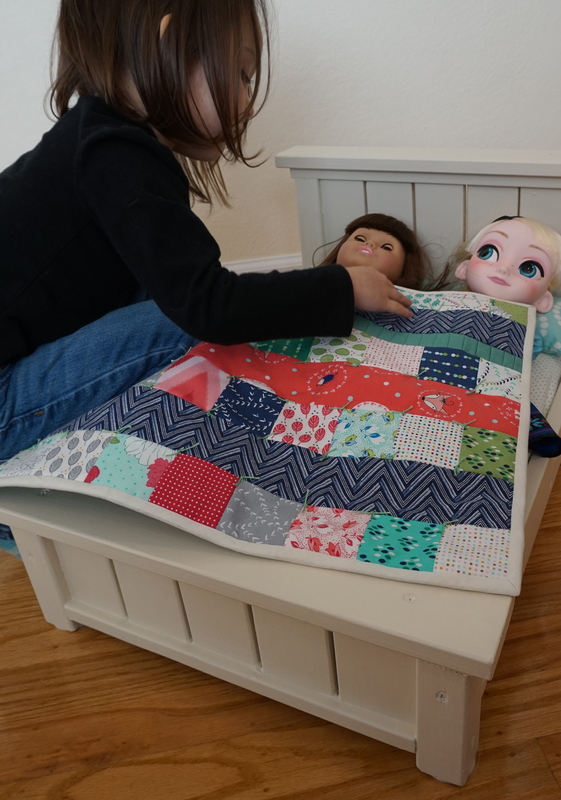 I purposely made the quilt long enough to fit just under the foot board and under the dolls’ chins. 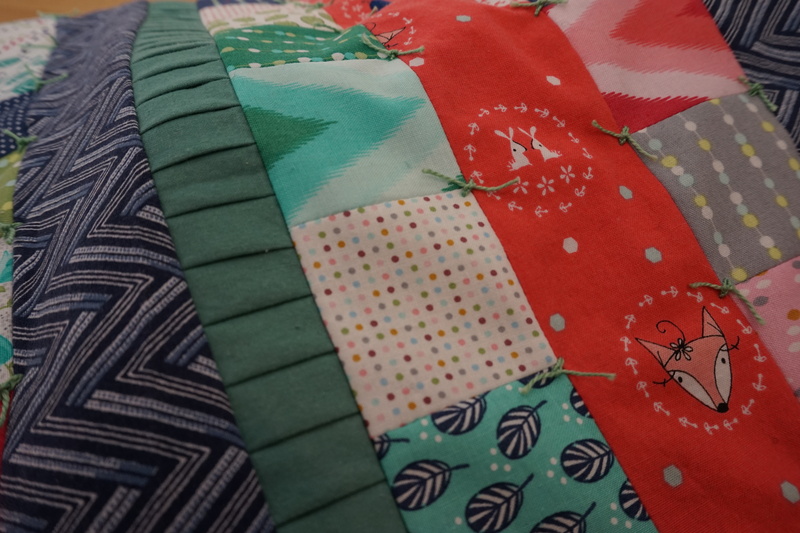 The quilt measures roughly 18″ wide by 15″ tall. She is very particular about how she wants the blanket to fit over her dolls! We had a lot of fun putting this together. 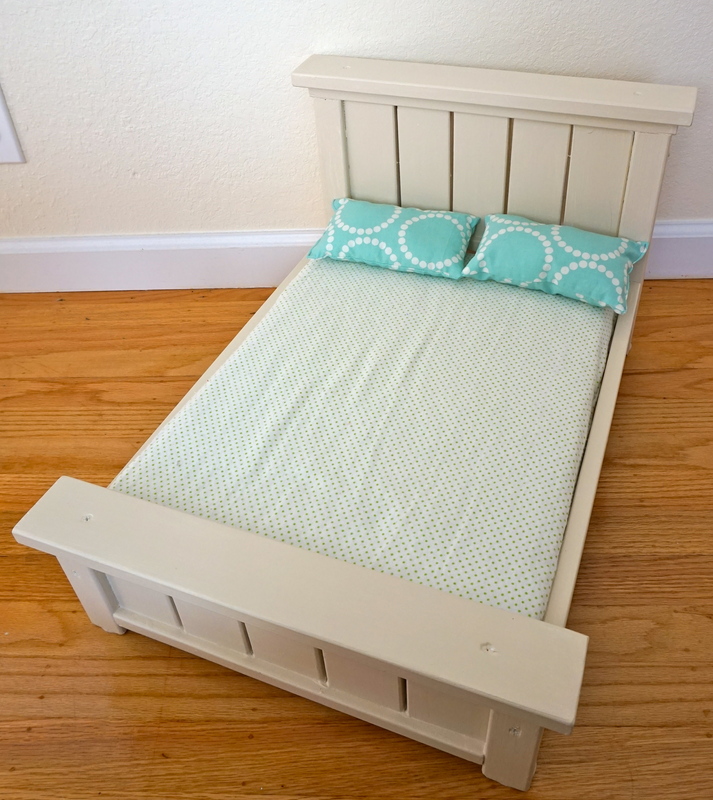 It was relatively inexpensive for all of the materials, the wood being the most expensive part. Everything else we had on hand leftover from other projects. The best part is that she loves it, it’s strong enough for her to sit on, and it means so much more because it’s handmade! That is tooo cute and in no way looks home made. Great job!! My little Khalia (grand daughter) would love that! !